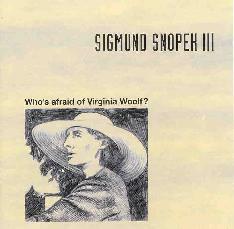 Sigmund Snopek III - "Who's Afraid Of Virginia Woolf" / "Nobody To Dream"
Sigmund Snopek III is a Milwaukee based multi-instrumentalist and composer who has been recording since the late 60's. These two discs are reissues and re-recordings of music written from the late 60's to early 70's. They may not be recent releases but they do represent an artist who has been around for many years that deserves to be heard. "Who's Afraid Of Virginia Woolf" was originally released in 1972 by Snopek's band The Bloomsbury people and includes bonus tracks. "Orange/Blue" is one of the disc's great tracks. At over 20 minutes the entire piece moves through numerous themes covering a whole gamut of classical progressive and psychedelic influences. Sometimes calm, at others aggressive. Some moods dark, others uplifting. It starts with an eerie bluesy bass line and piano melody, and there are some cool psychedelic freakout moments when the full band hits, plus passionate wildman vocals and an otherworldly chorus. But this is a multi-movement piece, and it soon develops into a bouncy piano led tune before returning to a theatrical song that represents progressive rock's earliest days, when psychedelia was becoming more complex and played by proficient musicians. The instrumentation is varied and includes keyboards, guitars, percussion, bass, violin, flute, and sax. The other tracks on the CD are similar, displaying a remarkable sense of melody and potent musical majesty. Snopek's varied stylistic interests are apparent throughout, covering classical influenced rock, psychedelia, and even jazz on the other big standout track, "Virginia Woolf". This instrumental powerhouse begins with a swinging lounge jazz jam. It soon winds down and leads into a manic percussion symphony with short freaky vocal and synth moments. Of course it changes gears again and the tune ends as cool jazzy-psych vocal number. As a bonus track the CD includes a version of "Orange/Blue" re-recorded in 1989 and abbreviated to 11 minutes. This is an instrumental version played in a rock symphony style, and demonstrates the level of musicianship Snopek progressed to years later. It's well done and successfully reproduces the original's exciting thematic transitions, but it lacks the character and variety of the original which easily held my attention throughout its 20 minutes. Another bonus track is the 15 minute "Lifencave Book Two", an electronic music and avant spoken word piece recorded in 1973. This is highly theatrical and, though completely different from the other tracks on this CD, still shares with the other songs Snopek's penchant for continual development of theme, mood, and pace. In fact, his web page indicates that this was performed live in 1974 at the International Electronic Music Festival in Nashville with musicians, poets, actors, mimes, fencers, and dancers. Wow! 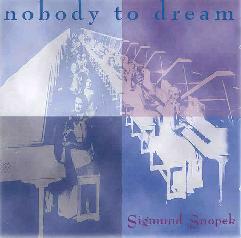 The "Nobody To Dream" CD contains recent recordings, but the music was written in 1968 and '69 as a work for string quartet and rock band, and was performed by The Bloomsbury People. In fact, the liner notes state that this is the fourth studio recording of this piece. In addition to numerous musicians and singers, Snopek plays keyboards, flute, oboe, bass clarinet, hunting horn, drums, electronic effects, bass, and lead vocals. The music is similar to the rock symphony re-recording of "Orange/Blue", but it's so well structured and develops in such a variety of exciting directions that I was transfixed throughout the CD's 45 minute length. However, remembering my comments about the re-recording of "Orange/Blue" versus the original I can't help wishing I could hear one of the earlier versions of "Nobody To Dream". I'd never heard Snopek's music prior to receiving these discs but it amazes me that discussions of classic early 70's progressive rock on the internet don't include him. Fans of complex multi-movement progressive with psychedelic influences would be well served by checking these out. (Though AI readers would probably prefer the Virginia Woolf disc.) Snopek is still active in a variety of musical projects in Milwaukee contributing to everything from the Milwaukee Symphony Orchestra to the Irish Festival. You can visit Sigmunk Snopek at his web site.